A greater, to complete the plan. To make man brother unto man. The Order is regarded as having started on the day Moth “0” produced and published his famous cartoon “Forgetfulness” on 7 May, 1927; the object being to establish “Shellholes” instead of “branches”, and “Old Bills” or “Commanders” in lieu of “Presidents” each running their own affairs, but working within the principles and ideals of the Order. Having started in Durban, the idea spread rapidly throughout the country – so much so that originally there was a good deal of confusion. It was only later that the term “Dugout” officially came into being, i.e. when District Commands were formed. This term extended to Provincial Commands. The ideal strength of a Shellhole was quoted as being between 30 and 100 members. Thus, it came about that during July 1927, an inaugural meeting of prospective Pretoria Moths was held at the Blackwood Villa Hotel where Munitoria stands today. At the time, Blackwood Villa was owned by the late Moth Bill Pritchards, who later moved to Swaziland. The meeting was attended by an estimated 500 to 600 ex-servicemen, and a Shellhole “San Fary Ann” was formed, with Moth W. Crofton Forbes, MC, as Old Bill. Here it should be noted that through some misunderstanding, no doubt due to the early confusion occasioned by the immediate and rapid expansion of the idea, some Transvaal Moths started off by forming units known as “Dugouts” instead of “Shellholes”. “San Fary Ann” was apparently so big as to be unmanageable, and during the following month (August), the “Whizzbang” Shellholes were formed at a meeting held in the Grand Hotel on Church Square. These were known as Whizzbang 1, 2, 3 and 4. As will be evident from the above, Pretoria ex-servicemen received the birth of the Order with the greatest of enthusiasm. It has been stated that, no fewer than nine strong units were in active operation in less than a year. Whether these units were all entirely independent or controlled by a particular “Dugout” is not clear, although indications are that the former is the more likely. Each of the Whizzbang Shellholes held their own meetings, albeit on the same night and venue (Grand Hotel), and at the commencement operated independently, although fraternising during the harmony. Amalgamation, to form a large single Shellhole under the same name, only took place at a later stage. The Old Bills of the original Whizzbang Shellholes were, respectively, AS Montgomery, JB Pettigrew, HCC Spooner and EJ Wickham. Despite the information contained in the following paragraph, the word “Dugout” has not been used for any of the units thus far mentioned. The record of Old Bills for “Whizzbang” shows it as having always been known as a Shellhole, with Moth AS Montgomery as the first Old Bill (1927-1929), followed by Moth EJ Wickham (1929-1930). In an article which appeared in a birthday issue of “Home Front” it is stated by the Editor: “In addition to the great Whizzbang Dugout with its three branches and San Fairy Ann, others formed in the first year were: “Pretoria No. 1 Dugout”: Old Bill Moth JC Gorie; “Pretoria Dugout”: Old Bill Moth T Scott; “Mons No. 2”: Old Bill Moth A Mackay; “Tim Lukin”: Old Bill Moth J Andresen; “Gunners”: Old Bill Moth FB Manning. Of these only Whizzbang survived for any time. The original Shellhole “San Fairy Ann” also did not last and very soon became defunct. This is confirmed by Moth Jack Wickham and is substantiated by the fact that no mention of it is made in the first issue of “Home Front”, i.e. August 1928. However, it is evident that the record in the first issue of “Home Front” cannot be accepted as proof, as it also makes no mention of the four Whizzbang Shellholes as already having been established at Bellevue, Transvaal. In mitigation, the Editor emphasised that the list of Dugouts and Shellholes as printed was incomplete, which is further proof of the confusion with resultant inaccuracies, which existed during the initial formative period of the movement, with its unprecedented development and rapid expansion to all Provinces. In the aforementioned “Home Front” (Volume 1 No 1), under the heading of units existing in the Transvaal, only two Pretoria units are listed, namely “Pretoria No 1” and “Pretoria No 2” Dugouts; the respective Old Bills being given as J Sinclair Gorie and AS Montgomery respectively. The Adjutant of the former was CW Howes. Incidentally, this first issue does list a “Railways Dugout” (Old Bill A Jones; Adjt. HL Duckworth), but does not indicate where it was established. It is considered that this was the forerunner of “Coal Box Dugout”, now Coal Box Shellhole. This Shellhole met in Berea Park Institute right up until about August 1963, since when meetings were held at the Moth Memorial Centre. The Charter of this “Dugout” is dated 1928. In 1929 Moth AE (Swiss) Koen was the Old Bill and he was subsequently made a Life Old Bill of the Shellhole. According to the Charter it was founded in February 1928 as “Coal Box Dugout”. During the next few years various other Shellholes sprang up; for instance “Sparks”, “Legs Eleven” (at the Central Prison) and “Bomb”. These too faded out after a comparatively short life. “Gorgeous Wrecks” followed, and incidentally as a “Dugout” vide its Charter dated 22 September 1938. This Shellhole is still going strong and very active, having celebrated its 500th meeting in March 1972. It is, however, claimed to have been founded in 1936, the first Old Bill being Moth RA Glenday (1936-39). Of the above original and pre World War Two units, only “Whizzbang”, “Coal Box” and “Gorgeous Wrecks” have survived the ravages of time. The post World War Two years witnessed another tremendous upsurge when numerous new Shellholes sprang up’ throughout the country. As was previously the case, some did not last long, two of those in Pretoria being “Bulldozer” and “Happy Valley”. The former was already in existence before March 1948, as it is listed in “Home Front” of that issue. Moth Zeiss was the first Old Bill. “Happy Valley” recruited most of its members from the then ex-servicemen’s village at Wonderboom Airport, and when it could no longer continue under its own identity, joined up with “Grenade”. The former two are still going strong, while the latter two are defunct. Presumably all four were established after March 1948, since none of them are listed in that issue of our magazine. “Ariel” founded on 13 September 1946. First Old Bill Moth AW Hutchings (1946-47). “Grenade” founded in June 1949. First Old Bill Moth PFE Banyard (1949-51). The Charter of this Shellhole is dated 09 August 1949. “Mark Il” founded on 16 February 1951. First Old Bill Moth DW Melvill (1951-52) who answered the call during 1964. “Field Marshal” established at Irene in 1952. First Old Bill Moth AD Brown. “Ouma” founded on 07 April 1953. First Old Bill Moth R Hall (1953 -54). “Casa Mia” founded 08 November 1953, by a splinter group of Moths who broke away from “Ariel”. First Old Bill Moth L Piper (1953 -54). This is the only Pretoria Shellhole where membership of the Moth Memorial Centre was a prerequisite to Shellhole membership. This has been so from the beginning and was possibly the main reason (another being that “Ariel” at .that time was considered to be too large) for the breakaway. “Colonel Bogey” founded in 1953 (month not known). First Old Bill Moth HB Hudson. Recently, unfortunately, forced to vacate their hall in Clubview. The Shell hole has a good collection of trophies, so fortunately is once again settled and holds its meetings at Irene. “Crossed Rifles” established with effect from 26 August 1959, largely due to the efforts of Moth Dave Reeves, to serve newly recruited Moths of the Eastern suburbs. Moth Reeves, although not resident in that area, was the first Old Bill (1959-61). A member of Ariel Shellhole and former Old Bill, he is the present Provincial Old Bill. “Seven Hills” founded in 1960. First Old Bill Moth EC Knox. This Shellhole meets at the CBC Old Boys Memorial Club. “Flying Wheel” this Shellhole, today the true Railwayman’s unit, meets at the Koedoespoort Recreation Club and dates back to 11 March 1962. First Old Bill Moth E Seyfried. Whilst every endeavour has been made to check all details and to give as accurately as possible the true facts, there inevitably remains gaps, doubts and, without doubt, in accuracies. An earnest appeal is therefore made to anyone with criticism and/or additional facts and details to make themselves known either through the medium of this magazine, or directly with the compiler of this record at PO Box 53, Botha’s Hill, Natal. 3. As is evident from the above, Pretoria ex-servicemen received the birth of the Order with the greatest of enthusiasm. 4. Thus, it came about that during July 1927, an inaugural meeting of prospective Pretoria Moths was held at the Blackwood Villa Hotel where the remains of Munitoria stand today. The meeting was attended by an estimated 500 to 600 ex-servicemen, and a Shellhole “San Fary Ann” was formed. 5. It was only later that the term “Dugout” officially came into being, i.e. when District Commands were formed. 6. It has been stated that, no fewer than nine strong units were in active operation in less than a year. Whether these units were all entirely independent or controlled by a particular “Dugout” is not clear, although indications are that the former is the more likely. 7. The Pretoria District Old Bills Honours Board starts with J Andresen in 1927, while the date on the current Pretoria District Charter is 23 October 1946. 8. To date there is no indication when the Pretoria District Dugout was first mentioned in the “Home Front”. 9. Through some misunderstanding, no doubt due to the early confusion occasioned by the immediate and rapid expansion of the idea, some Transvaal Moths started off by forming units known as “Dugouts” instead of “Shellholes”. 10. It was only later that the term “Dugout” officially came into being, i.e. when District Commands were formed. This term extended to Provincial Commands. 11. Why was the name Pretoria chosen for the District Dugout? In all probability, the Shellholes were geographically grouped into Districts and Pretoria formed a nodal hub. 12. 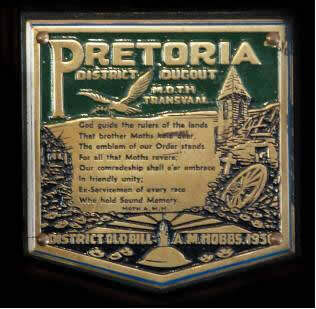 The Pretoria District Dugout badge depicted below is on display at Warrior’s Gate in Durban. Unfortunately, the symbolism and the meaning behind the images on the badge are not known. DISTRICT OLD BILL – A.M. HOBBS 193? 13. The District Old Bill’s Honours Board reflects that Moth AM Hobbs was the District Old Bill in 1932, 1935/36, 1938, and 1939. A calculated guess, based on the barely visible outline of the last numeral, could be 1930 or 1936. This is the closest we could get to dating this badge. 14. 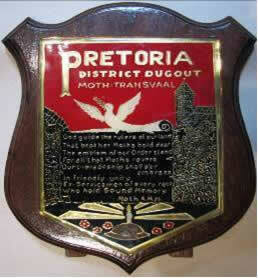 The shield with Pretoria District Dugout badge depicted below is on display at Evenden House in Pretoria. Unfortunately, the reasons for the omission of a date and the changes in colour from green to red, in the wording and in the layout are not known. 15. Once the Pretoria Moth Memorial Club in van Boeschoten Ave had been completed in 1948 and the official opening had taken place, it served as the meeting venue for the Pretoria District many of the Shellholes in the District. 16. 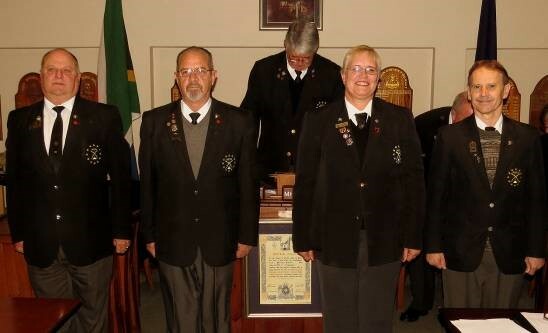 Traditionally, the District held its monthly Dugout meetings at the Pretoria Moth Memorial Club on the third Wednesday of every month, starting at 20:00. After the Pretoria Moth Memorial Club closed its doors on 30 September 2000, the Pretoria District first met at Coalbox/MkII on the second Tuesday of every month and the starting time changed to 19:00. The Dugout then moved to Evenden House in 2004. In 2012, the monthly Dugout meetings changed to the third Thursday of the month. 17. By all accounts, the MOTH General Conference only approved the concept and format of the MOTH Charter on the 5th of July 1938. 18. There may well have been an original Pretoria District Charter but there is no evidence to this effect. The reason, if any, for taking a second Charter into use, is equally non-existent. 19. 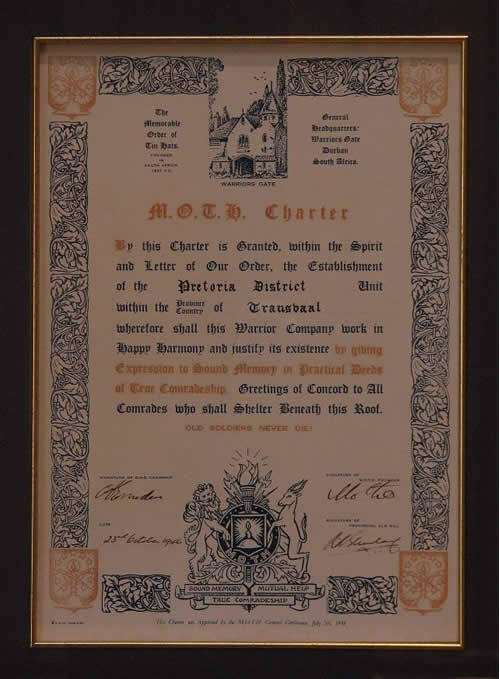 The current Pretoria District Charter depicted below was signed by Moth “O” and is dated 23 October 1946 when the District was part of the then Transvaal Provincial Dugout. 20. Over time, the decision was taken to rationalise the provincial structures and to create the Platinum Provincial Dugout to which the Pretoria District now reports. 22. Since the Pretoria District started in 1927, thirty-five different Moths have served as Old Bills covering forty-two terms of office in the space of some 85 years. 23. During this period, Moth Hobbs intermittently served as Old Bill for five years, while Moth Quinn served a consecutive eight-year term as Old Bill. Moth Hollingworth is the Old Bill with the longest District service totalling ten intermittent years between 1959 and 1983. 24. The Pretoria District Dugout reported to the MOTH General Headquarters via the Transvaal Provincial Dugout, which amalgamated with the Southern Gauteng Provincial Dugout to form the Platinum Provincial Dugout in 2009. 25. The following three Outpost Shellholes report directly to the Platinum Provincial Dugout: Botha Shellhole in Pietersburg, Turbi Hills Shellhole in Louis Trichardt and Minefield Shellhole in Phalaborwa. 28. Initially the Pretoria Shellholes met at several hotels in the Pretoria CBD. After the official opening of the Moth Memorial Centre in van Boeschoten Ave by General Jannie Smuts on 03 July 1948, most of the Pretoria-based Shellholes held their monthly meeting at the “Moth Club” as it became known then. 30. The Pretoria Sound Memory Cottages Scheme was started in 1973. 31. The Pretoria Sound Memory Cottages consists of 6 single units and 12 double units, which are situated at 360 Eloff Street in Eloffsdal. 32. Since the Joint Management Board was dissolved by the withdrawal of the Mothwa in November 2011, the Cottages are again run by an elected Management Committee, which reports directly to the Pretoria District Dugout. 33. The Mothwa Haven is situated at 353 Booysens Street in Eloffsdal, right next door to the Pretoria Sound Memory Cottages, mentioned above. 34. In addition to the Old Age Home facilities, they also provide a step-down service and a frail care service. When the first Moth National Bowls tournament took place in Pretoria from the 24th to the 29th of May 1971, I saw a dream come true. For quite a number of years prior to this I had said surely we can have a National tournament run on the same lines as the South African Championships. Everyone I spoke to thought this would be great, except no one was prepared to undertake the running of it. One evening while sitting in the Pretoria Moth Club, having a couple of quiet snorts with the late Cyril Wilson, I sold him the idea that we had within the framework of our own Casa Mia Shellhole members who I knew would be both willing and capable of running the type of tournament that I had in mind. Cyril said that if I could get headquarters’ permission he would be right behind me: and at that moment in time the Moth National was conceived. Having been given permission from my Shellhole, and armed with the assurance that should there be any financial loss, it would stand good to the tune of one thousand rand, we started to go through the normal Moth lines of communication; and finally on Sunday morning Cyril and I found ourselves seated at the main table at Warriors Gate. I put my story to those sitting at the table, and must say that I did not get a very heartening response. Nip Levy, who has since passed on and was then the General Secretary of the Order, said that in his mind the running of a National Moth tournament would not work. I got the feeling that most of those present were of the same opinion. When I explained that Headquarters would not be in any way involved financially, and that all that was really required by us, was permission to hang a National tag on the Tournament, we were given the green light. Cyril and I left Durban to go back to Pretoria, two very happy boys, but also fully aware of the size of the task we had set ourselves. The first tournament, which was held in Pretoria, took us the best part of two years to organise. One hundred and thirteen teams took part and we were privileged to have the National Chairman Moth, Jimmy Scott playing. Everyone had a ball and from all the letters we received and from Shellhole notes in Home Front, we knew that the Moth National was there to stay. The second show was also staged in the Capital City and was just as big a success as the one the previous year. This time, plus minus one hundred and forty teams entered. Can those who were there still remember the night we court marshalled the National Chairman, and after having found him guilty of bringing up a mixed team from Durban, took him outside the Pretoria Moth Club and shot him! At the meeting chaired by Jimmy Scott it was decided to hold the next tournament in Durban. The Durban show was very well run by an excellent committee with Max Giddey in the Chair. Two hundred and twenty one teams pitched up for the game. So you will see we were now out of the cradle and starting to find our sea legs. At the meeting, it was decided to appoint four trustees. It was also decided to hold the 1974 tournament in East London. I am sure that those of us who were privileged to play in East London still have very pleasant memories of the week we spent in the “Fighting Port.” Who will ever forget that morning of the 6th of June at sunrise when we all gathered on the Orient beach and saw the landings on Normandy re- enacted with such reality I can still see the piper walking up and down on the fringe of the waves, the frogmen, the troops, aircraft over head and the ships with the sun just rising over the horizon. And then the prayers on the beach by Moth the reverent Don Martyn for the souls of those who by their sacrifice made it possible for us to be there that memorable morning. The organisation in East London was out of this world, and congratulations were showered on Neville Tubb and his band of merry workers. Had it not been that petrol restrictions had just been enforced, Neville was certain that the entry would have exceeded two hundred and fifty teams of four. The following year, 1975, we all went to the Golden City. This was a fabulous tournament where we had the pleasure of playing on first class greens, and were treated like royalty by all these wonderful people at the various clubs. Paul Prinsloo, that very able administrator, was at the helm for this get-together and was very well supported by a top line committee, who never spared themselves in their efforts to make our stay in Johannesburg a very pleasant one. Next year, 1976, all the old stalwarts packed their bags and woods, and once more moved down to the coast, this time to the friendly city of Port Elizabeth, and friendly it really was. Unfortunately, the man in charge of the elements was not all that kind to us. Doug Gamble held the reigns for this show and with his committee made a first class job of the tournament. Now it is 1977, the 50th year of Mothdom and here we are all back in Durbs for what I am sure is going to be the biggest tournament of them all. We who have either played in or have been associated with the previous shows all look forward to shaking the hands of old friends and the pleasure of meeting new ones. Alas there are always some sad moments, when you ask after Piet or Harry or Jan or Jack and you are told that they have gone to join a Shellhole in the sky. Obviously out of these yearly shambles, certain characters have emerged. I think of “Honest Denny” who will bet you on anything and thinks he knows more about handicapping than the Jockey Club. Not forgetting his side kick, John Austin, the bloke who is always standing in a hole. How about Kim Rose from Welkom, the man with the big walking stick and the seemingly endless supply of biltong. What a tonic it is to see and speak to Ron Ackerman from Sea Gull in the Western Cape, the man who I think played rugby for more provinces than any other person. Today Ron has two artificial legs and he plays bowls with the best of them. There is that singing Moth from Pietersburg who Santa Claus forgot, and the bloke who walked around in a blanket. He said he was playing like one, he might as well look the part. I believe that these annual indabas have done a lot for Mothdom; which at the time they were started needed a good shot in the arm. They give the rank and file of the Order the opportunity to meet other Moths from the four corners of the Republic and beyond its borders. Many have been heard to say that they would rather play in our tournament than the South African Championships. I venture to say that two of the reasons for this is firstly one has to have experienced the spirit of camaraderie that exists during these get-togethers to appreciate what it’s all about, and secondly although every team plays hard to win, those who lose do so with good grace. To all those Shellholes who have never taken part in a Moth National Bowls Tournament, I can only say: You do not know what you are missing. In conclusion, may I once again say how proud I am to have sired these tournaments. I trust and pray that they will continue as long as there are men who with pride wear the badge of front line service. The 1996 Tournament, hosted by Pretoria, resulted in Colonel Bogey as the winners and Gorgeous Wrecks as the runners-up making it an all Pretoria District affair.